Are you interested in a career as an EMT or an RN? Here's a brief overview of some important differences. Knowing how to respond in an emergency situation is vital for patient survival, which is why EMTs are taught early on how to handle stress. This initial training helps Emergency Medical Technicians, or EMTs, maintain a level head when arriving to a gruesome accident or any other traumatic scene. Registered Nurses, or RNs, are also equipped with this type of training. But this is typically much later in their education. That’s just one small difference between the two. For those looking into becoming an EMT or a RN, let’s take a look at some other differences. EMTs learn life-saving medical training too. Or at least, the crash course version. Let’s take a look at the differences between an EMT and a nurse. The first big difference is how long it takes to become an EMT or an RN. EMTs undergo training to save lives, but compared to RNs, this is a crash course. It only takes 2 years max to become an EMT versus 12 years to become a nurse. In addition, medical students can potentially become an EMT as early as 16 years old in some states. Typically, the only thing a med student needs is to meet the minimum requirements of the National Highway Traffic Safety Administration, or NHTSA. This involves a state-approved EMT course, an EMT Psychomotor exam, and passing the National Registry of Emergency Medical Technicians (NREMT) certification test. These tests are available in at least 45 states. There are multiple levels of exams too. Each test addresses criteria EMTs need to know to advance their career to the next level. Emergency Medical Technicians: can do everything an EMR does, as well as the more complex versions of said care. Examples include complicated childbirth delivery and Continuous Positive Airway Pressure or CPAP. Paramedic: typically the highest level of pre-hospital medical providers. Can administer drugs, cardiac monitoring, manual defibrillation, and chest needle decompression, among other things. To compare, RNs learn essentially everything paramedics do, depending on their preferred field of medicine. Preparation for taking the EMT exams vary from under 100 hours to over 1,500. As you can probably imagine, the difference in student-to-career time reflects each occupation’s average salary. For example, paramedics make about $41,000 a year. RNs on the other hand, can make upwards of $63,000 annually. EMTs are roughly half that, earning $31,000 on average. RNs usually work in hospitals. Here, they may be required to work either with emergencies or with non-life threatening cases. As the name implies, EMTs deal with emergencies. Paramedics mostly work in ambulances dealing with both. One thing both RNs and EMTs have in common is their workload. Both professions find themselves working at least 12 hour shifts or more a good portion of the week. RNs are typically hired by a hospital, specifically the one they work at. 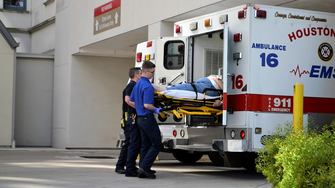 EMTs, however, can be employed by a wider range of employers. This can include private ambulance services, governments, hospitals, and even fire departments. Working as an EMT is a great way to kick start your career in the healthcare field. Whether you decide to volunteer first to see if the occupation is right, or if you go all in and start taking the courses, is entirely up to you. Becoming an EMT also has a clear path to advance your career and move up the ladder, so that’s something to keep in mind.